You are an amazing mama to your 4 beautiful children, and an inspiration to us all. I love that quote you shared. It’s so important. People think they’re helping by tiptoeing around, not reminding us… as if we could ever forget. Ignoring the absence of our loved ones says “we don’t want to carry this burden with you.” Acknowledging it, facing the hole head on with us says “we’ll share this weight”. It amazes me when people don’t understand this. They were here, we loved them, they were important. That they’re no longer here does not change our feelings for them. If I didn’t know about Jake and Sawyer I wouldn’t really know “you”. That is something I would never want to miss out on. Sending love and missing you! Dear Lanie – Happy Passover to your whole family. 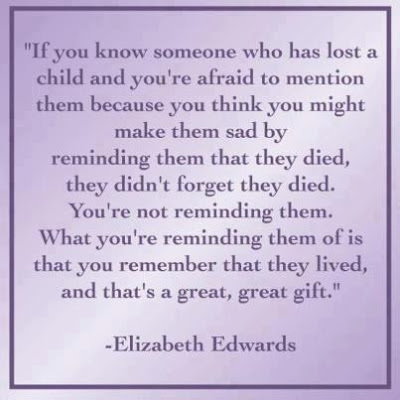 Your quoting Elisabeth Edwards is great and the fact that you can now tell everyone about Jake and Sawyer shows how strong you have become in dealing with your family history. My wishes go to all of you for much joy in each other.